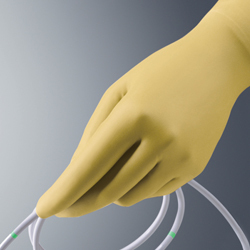 Medline Radion-X™ Radiation Protection surgical gloves are lead-free and environmentally responsible. The radiation protection surgical gloves are powder-free and made from natural rubber latex. These surgical gloves are commonly used in diagnostic heart catheterizations, coronary angioplasties, angiocardiography, urology, orthopedic surgery and anesthesiology/pain management. Anatomically designed for comfort, the Radion-X Radiation Protection also offers enhanced tactile sensitivity and dexterity.